Just for the fun and coolness of this magic moment in history . . . The Game of Predicting History . . .
Fair to be played up until 6AM (Eastern) Tuesday, November 4th, 2008.
then carry them around in your head. The largest Obama’s Electoral College could be is 396 if he won everything I predicted plus Indiana 11, Georgia 15 and Montana 3. I’ve been using the term “convincing win” for the last 3 or 4 weeks. I don’t think “blow out” and certainly not “landslide” will be appropriate. He’s known as “Landslide” forevermore. A convincing winner he still shall be. For a full listing of great reporters and news sources — check out my Political Sources Primer. For one of the most historic events in American history — check out my Obama Inauguration Adventures. 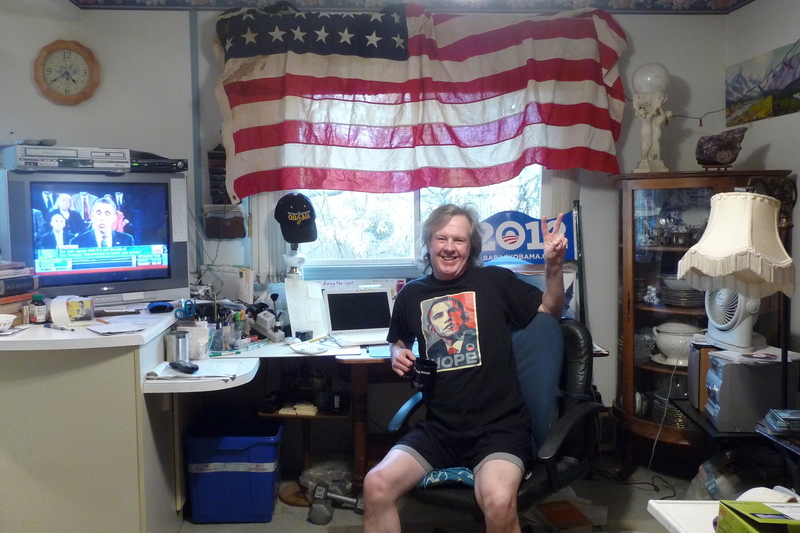 For how Woodstock promoter Michael Lang used my reports in his book — check out how Obama’s Inauguration was like Woodstock. For an account of the most jubilant night in the history of New York — check the Election Night 2008 Adventure. For a night in New York that started out just as joyous — check out the Election Night 2004 Adventure. For the kind of creations that got us across the historic finish line — check out my poem and video for Where Wayward Jekylls Hyde. For an on-the-campaign-trail adventure — check out the physical altercation I was in the middle of with Al Franken at a Howard Dean rally in ’04. For my tribute to a great political reporter — check out my Tim Russert tribute.